Discounts on Amazon's hardware don't happen very often, especially with the already-cheap Echo Dot. The largest (official) discount was on Prime Day, when the smart speaker went for $34.99. If you missed out on that deal, Amazon is now selling the Echo Dot for $39.99, a $10 drop from the usual price. If you're completely unfamiliar with it, the Echo Dot is Amazon's cheapest (and smallest) Echo speaker. It's not the best for playing music, but it can do everything the larger Echo can, including making voice calls and functioning as an intercom. Unlike the Google Home Mini, the Echo Dot has a headphone jack for connecting external speakers. We reviewed the Echo Dot 2nd generation last year, but far more functionality has been added since then. 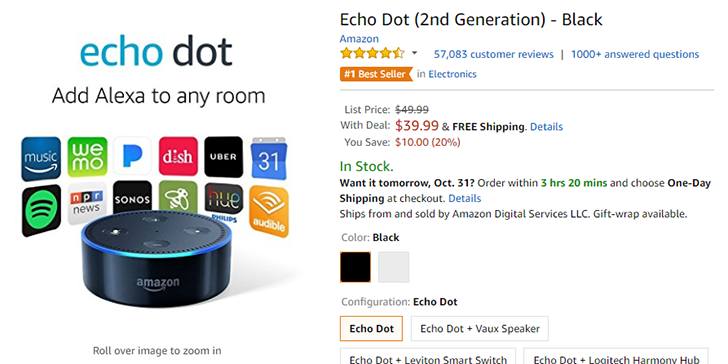 You can buy the Echo Dot from various retailers at the links below.